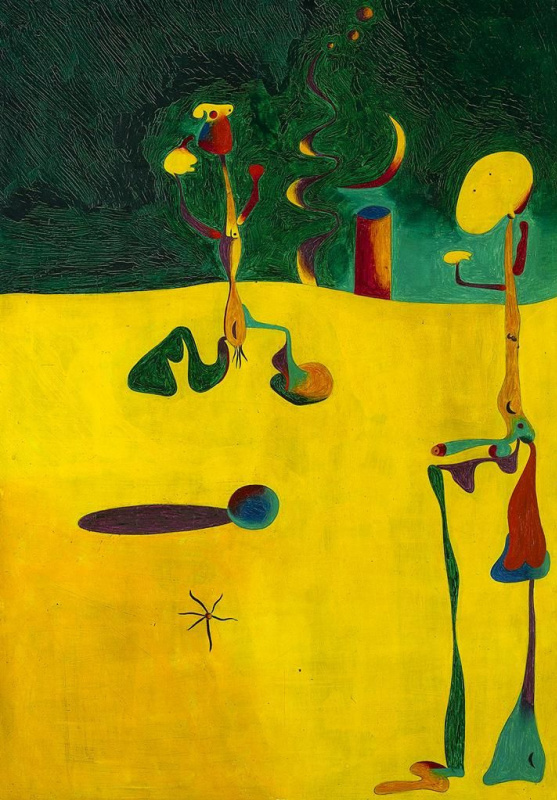 Regular reader of the Telegraph newspaper revealed a mystery that puzzled auction house experts, who put up for sale a painting "Femme dans la Nuit" by Joan Miró, the Spanish surrealist. 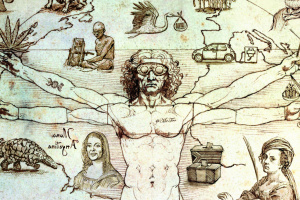 The artwork has a preliminary estimate of $ 18 million (£13.8 million). 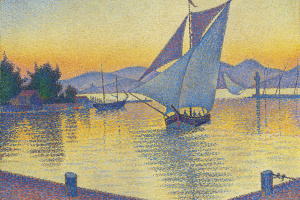 The sale of this valuable painting was entrusted to Phillips, the number three art auctioneer in the world. This was announced two weeks ago in the Telegraph. In the article with reproduced image of painting readers were asked various questions about the artwork, such as why was the night white or what were those curved lines in the night sky? 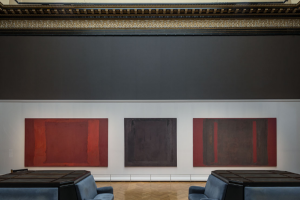 An expert at Phillips has consulted a former curator of the museum in America, and checked all the available books about the artist. He suggested the squiggles were smoke from the downed aircraft. 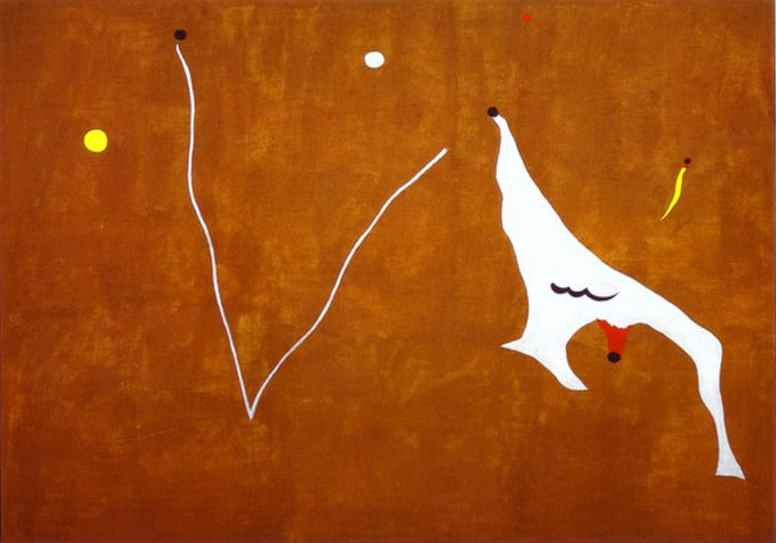 The painting was one of a series of 14 white background paintings made by Miró in the final stages of the Second World War. The black circles, according to the expert, symbolize the falling bombs. However, 82-year-old Barbara Whitaker from Buckinghamshire, carefully studied the reproduction in the newspaper, found another answer. "I cannot draw at all," the woman wrote to the editor, "but I think that the squiggly lines at the top are his name." 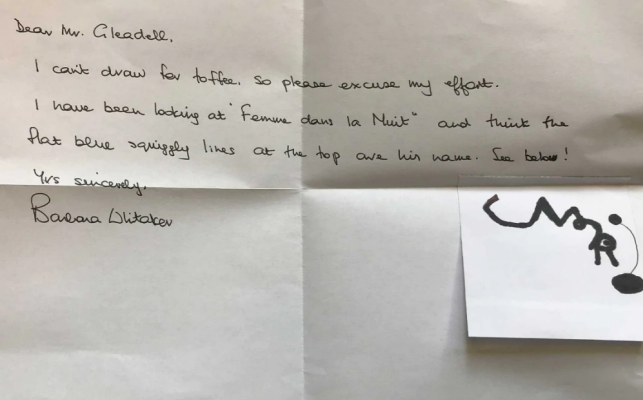 She attached her own drawing to the letter, in which the spelling of "Miro" was visible. Her theory seemed so believable to the journalists that they forwarded her letter to Phillips and got an answer. It turned out that the insight of Mrs. Whitaker helped solve the riddle not only of "Women in the night." Having examined all fourteen canvases from the "white" series, the experts were amazed to have found similar inscriptions made by the artist. 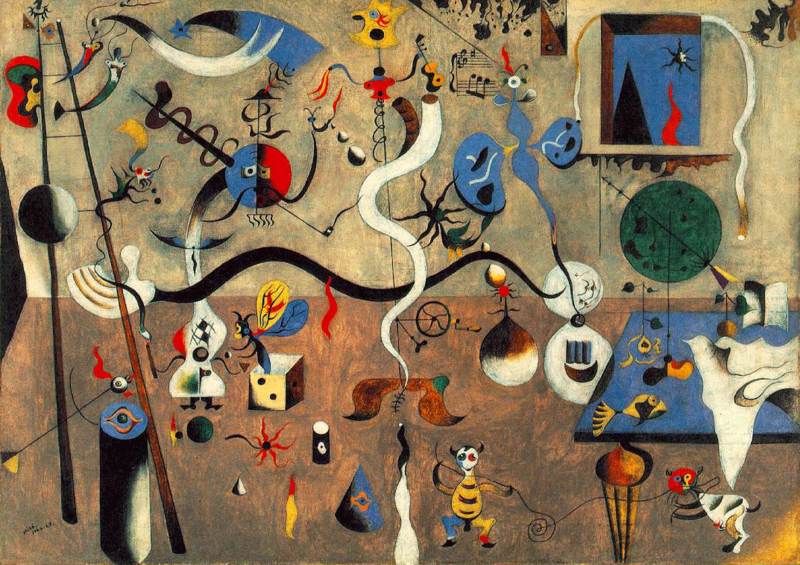 Miró often used pictograms or ideograms in his paintings, which could convey more than one meaning or message. A number of Miró's experiments with avant-garde pictorial styles, such as the Cezannist "La Publicidad" and Flower Vase (1917) and the Fauve-inspired Portrait of Enric Cristòfol Ricart (1917), illustrate the development of a personal style which challenges both traditional and vanguard views. Beginning in 1925, Miró began to plan blocks of work in advance, grouping drawings from the pages of his notebook into predetermined series. 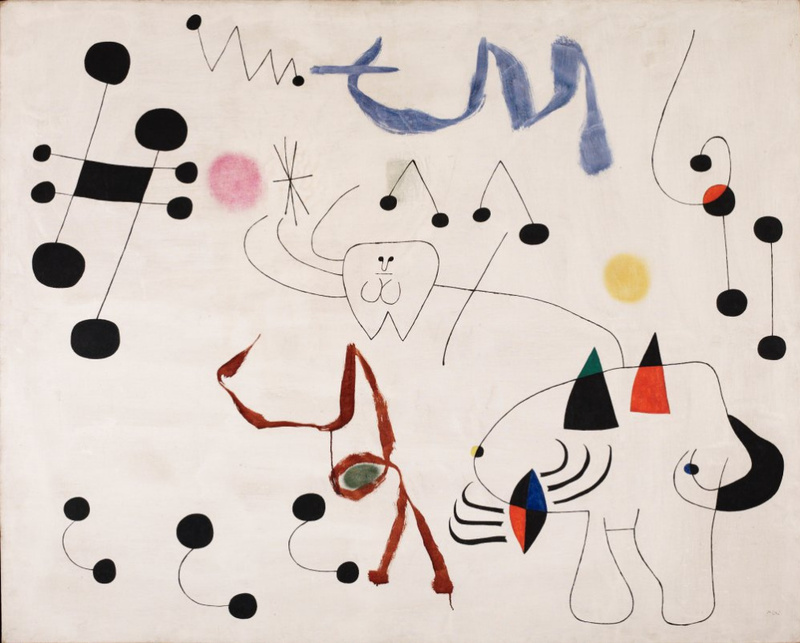 Miró's series are not based upon variations on a single theme or motif or permutations of a given set of elements, but rather are defined by a consistent conceptual grouping. This is obvious in the sequence of remarkable "dream" paintings of 1925 to 1927. 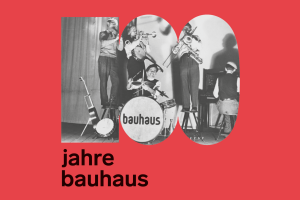 These paintings, in which recognizable imagery gives way to schematic lines and opaque shapes held in suspension against loosely brushed and monochromatic grounds, have frequently been seen as exemplars of Surrealist automatism. 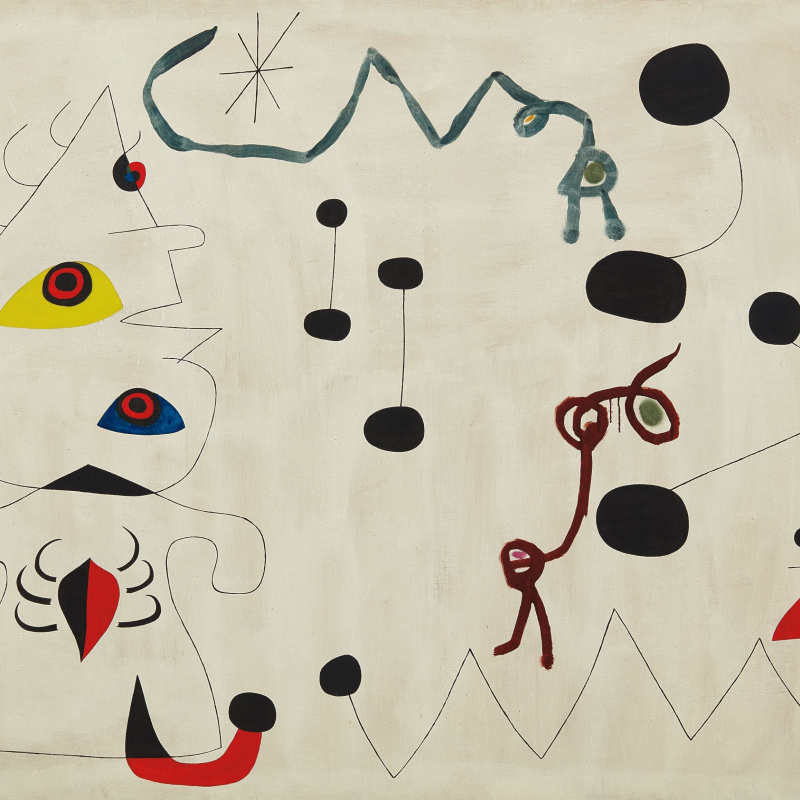 By 1930 Miró told his friend Sebastia Gasch that he was ready to bid a "farewell" to painting; and, indeed, for the next two years, his energies were increasingly devoted to assemblages and constructions incorporating such untraditional materials as shells, mirror, rock, and nails. 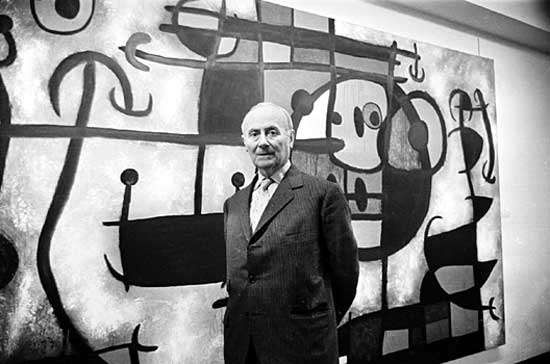 A call to Mrs. Whitaker established that, while she was no art historian, she had a fondness for Miro. She had visited the Joan Miró Foundation in Barcelona and had some books on the artist, including one in which the reader is invited to place different symbols around the reproduction of a Miró picture to suit themselves, which she bought for her grandchildren to play with. The second half of the 1930s turned out to be a turbulent period for Miró due to the political climate and the Spanish Civil War. 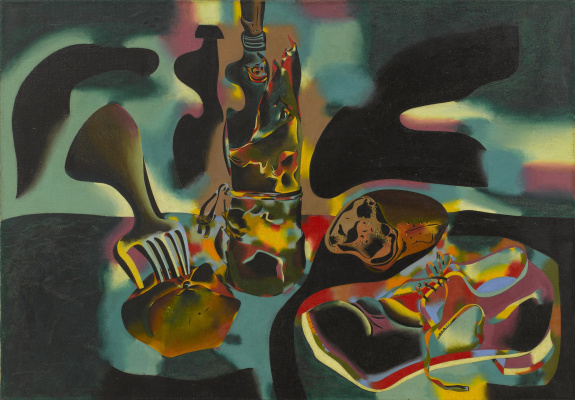 During 1937 and early 1938, he stopped working in series and produced two paintings stylistically unique in his oeuvre, and utterly different from each other: Still Life with Old Shoe and Self-Portrait I. 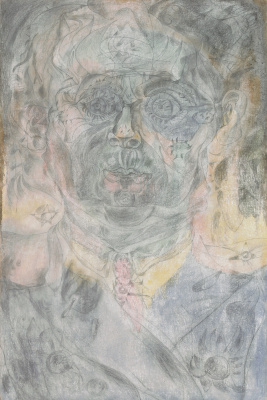 Having been forced to live in exile in France until the middle of 1940, he began a series of twenty-three paintings, collectively known as the Constellations, mainly in gouaches and oil, on uniform sheets of paper. 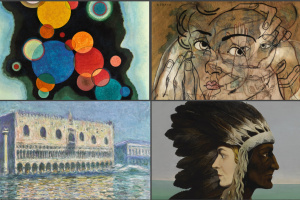 Within the clearly defined lines of these small-scale works, the artist compressed the whole of his knowledge and vision, giving the paintings a sense of immensity, despite their small size. 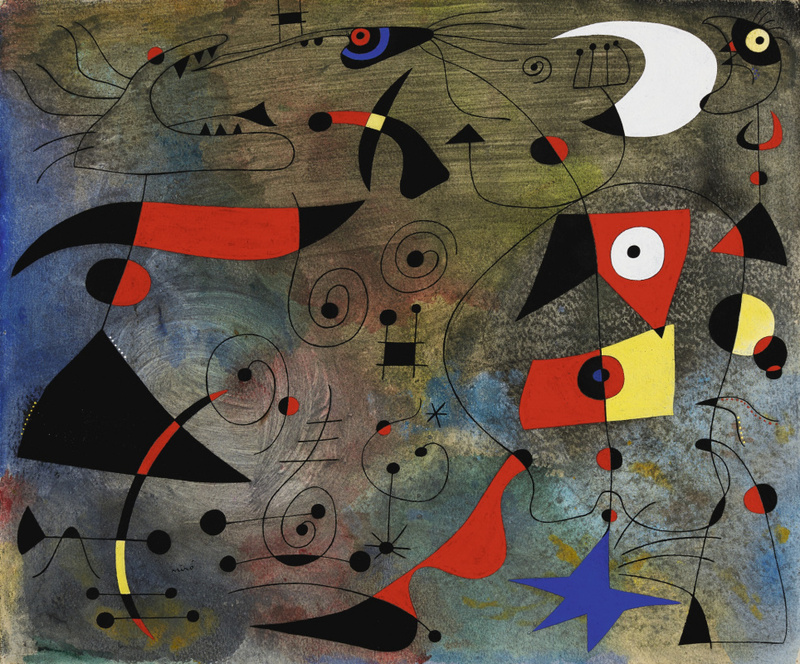 By the end of the war, Miró had established the calligraphic, magical imagery of women, birds, stars, and wiry figures for which he was to become renowned. 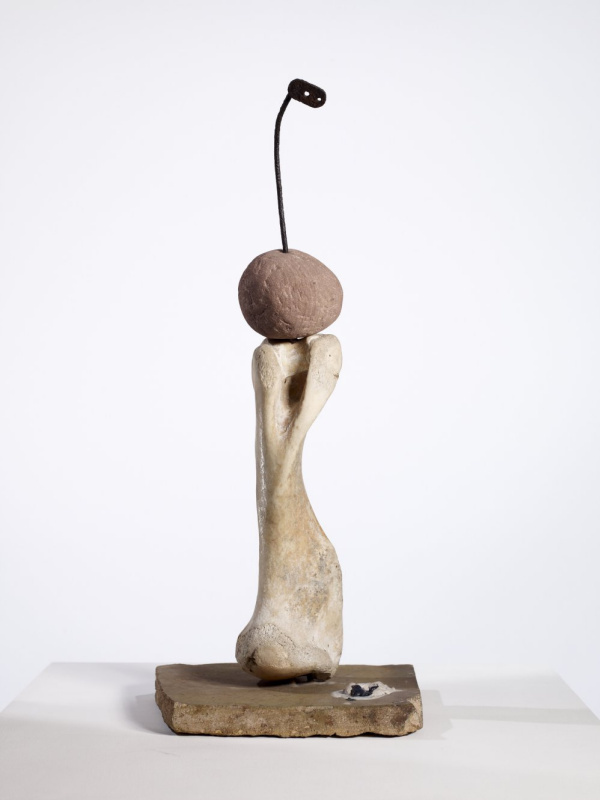 He returned to poetic, whimsical titles, such as The Bird Boom-Boom Makes His Appeal to the Head Onion Peel (1952), which recall his early "painting-poems" of the 1920s. 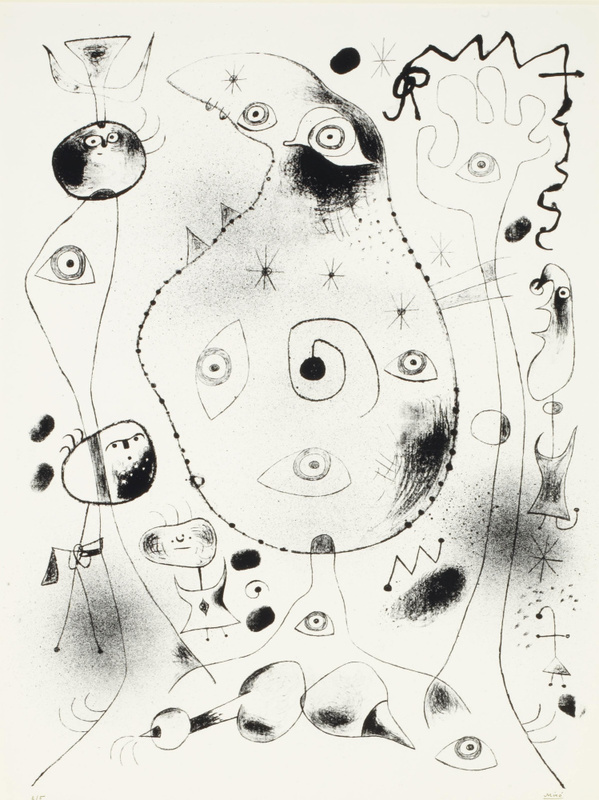 From the 1940s through 1960, Miró focused increasingly on sculpture, ceramics, and printmaking. During the last full decade of his life, Miró executed a large number of paintings that were freer and more gestural than ever before. 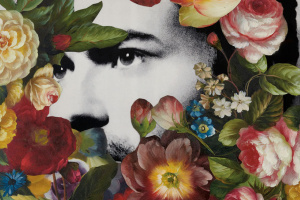 In the paintings from the 1970s, there is a sense of foreboding, urgency, and unseen danger which strikes an emotional chord unique in the artist’s career. 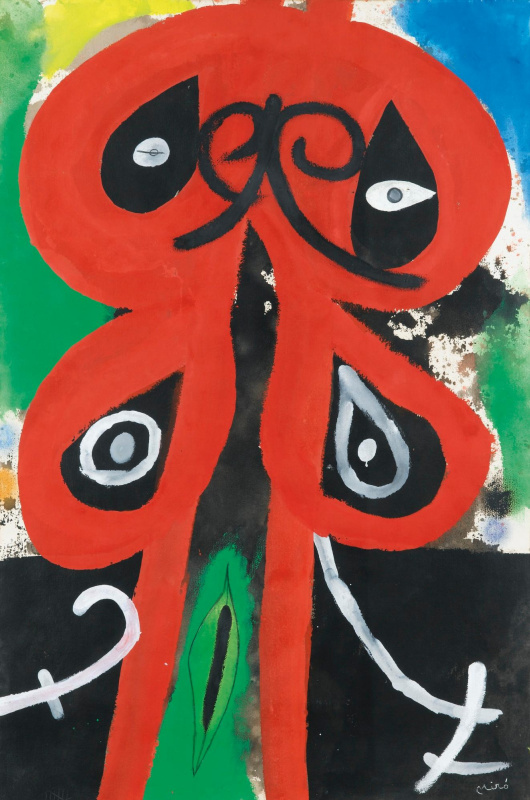 Like Picasso’s late paintings, they reflect Miró's struggle to deal with mortality, yet their unabated energy betrays no diminishment of his artistic will, or of his need to give form to the joy and predicament of life. 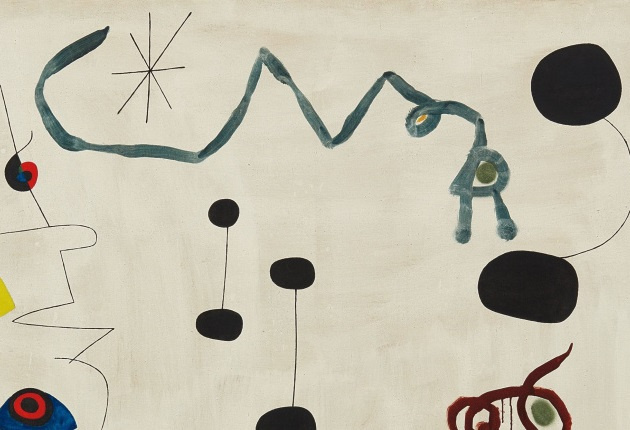 Now, the experts at Phillips have decided to study more deeply how Miro used pictograms to add at least one more paragraph to their catalogue for the sale in New York in November. 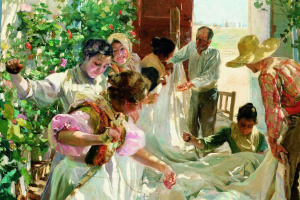 So far, no one can say for sure whether this discovery will add value to the painting, but experts emphasize that the credit belongs entirely to the reader. Recall that in June 2017, Joan Miro’s The Woman and the Bird (1940) was sold at Sotheby’s for £ 24.6 million, setting a record for the artist in this currency. 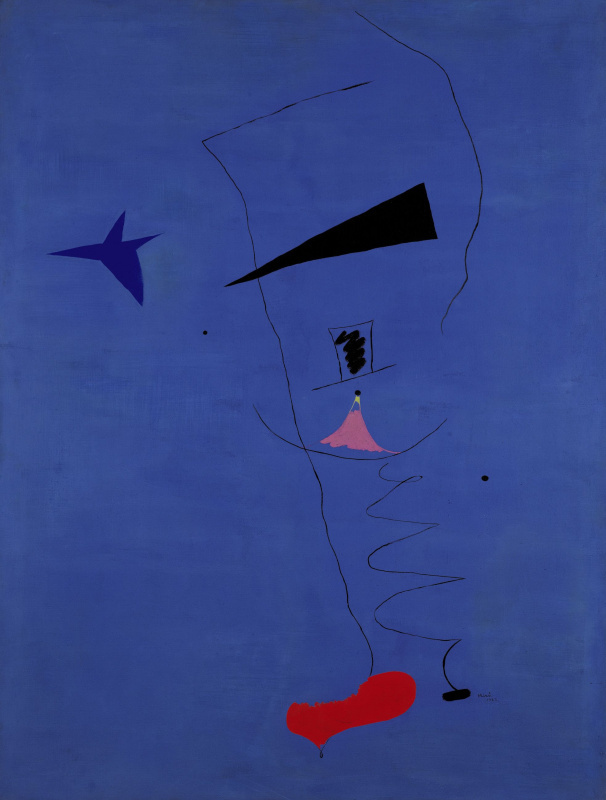 And the most expensive piece of surrealist ever put up for open bidding is the abstraction "Painting (Blue Star)". 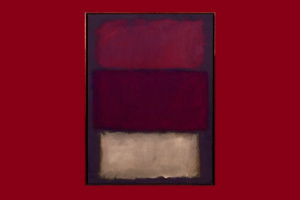 In June 2012, a private collector paid 36.9 million USD for the masterpiece. The painting "Femme dans la Nuit" will be sold at auction in New York on November 15, 2018.